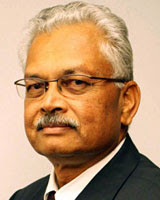 Fiji's Reserve Bank Governor Sada Reddy has defended himself against criticisms he had a hidden agenda when he devalued Fiji's currency by 30 percent in April. In an unusual move the normally tightlipped Reddy gave a series of interviews with the local and overseas media in response to criticisms, including from bloggers, of his handling of RBF policies since he moved into the new position. “There is nothing hidden in our figures. We publicise everything. Every cent is accounted for. We are audited. We’ve got nothing to hide,” he said in an interview with Fijilive. Last week Reddy said in a statement that foreign reserve levels had hit the $1 billion mark, equating it 3.5 to 4 months of cover. Reddy also explained to Fijilive why the devaluation was by 20 percent and not lower, saying it was a calculated judgment call aimed at quelling all speculation about the future of the Fijian currency and therefore stabilising all outflows of reserves. “When we devalued there was a $100 million increase in reserves and the chart continued to go up. It is important that people understand that if, after devaluation the chart had gone up and started coming down, it would have been a very difficult situation. But fortunately the policies worked and let me say I was myself surprised at the speed with which it turned around. A lot of it was speculative. You have no idea how much money leaks out of the system," he told Fijilive. Reddy has ruled out the possibility of a further devaluation or a revaluation of the Fiji dollar.
" Reddy also explained to Fijilive why the devaluation was by 20 percent and not lower, saying it was a calculated judgment call aimed at quelling all speculation about the future of the Fijian currency and therefore stabilising all outflows of reserves. " I'm no economist by any means, but this language from a Reserve Bank Governor, doesn't sound like sound Fiscal Policy or an Economists language at all. [ I had to do a pretty hefty one ] ! ( devaluation ). [ I know from experience that even 10 % would have " killed it " ] ! [ I know how to stop this psychology ] !
" “When we devalued there was a $100 million increase in reserves and the chart continued to go up. " God help Fiji with this clown running the most important Financial Institution in the country. Of course if you devalue something against something else, it's Dollar amount will increase, but it's value decreases silly ! Didn't he understand that it would cost more to purchase the same amount as before the devaluation ?
" It is important that people understand that if, after devaluation the chart had gone up and started coming down, it would have been a very difficult situation. " So it's important to understand that the chart must go up ! The chart and his ability to understand the psychology is what determines the financial Strategy adopted by this clown, not sound Fiscal policy ! Using his reasoning, why not devalue the Fijian dollar 100% and double the reserves ? This would make the chart go straight up to $500,000,000 and put the reserve at around $2,000,000,000. But he forgets, it would cost 20 times more to buy something in from overseas and decrease the value of anything exported from Fiji by 20 times. So a kilo of bananas would sell for $5, not 25 cents, but who wants to pay that much when you can buy them for 20 cents a kilo from within your own country ? And I thought the President was the Senile one and Frank the Bi Polar ! Still working from New Zealand? No wonder the Reserve Bank issues press releases like some media publication machine to justify Sada's existence.